Redmond Barry was born in Ireland in 1813 and emigrated to Australia in 1839. Having been admitted to the Irish Bar as a lawyer in 1838, Barry began life in Melbourne by befriending as many solicitors as he could, in the hope that they might send work his way. But the Supreme Court was still based in Sydney, so he didn't have much luck, and often only just managed to pay his rent. Not to be discouraged, Barry took on whatever cases he could, from representing drunken horse riders to drawing up John Pascoe Fawkner's will. 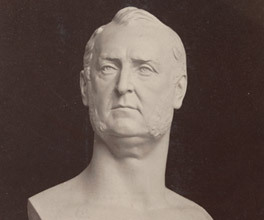 After Port Phillip became the colony of Victoria in 1851, Barry became the first Solicitor-General. In 1852, Barry was appointed judge of the bench of the new Supreme Court of Victoria. In between court sittings, he devoted a lot of his time to helping Aboriginal prisoners charged with crimes against a white man's law that they barely understood. This work was often without payment. He had a great sympathy for Aboriginal people, who he insisted were equal to whites. This kind of thinking put him at odds with nearly all legal circles and society in general, but he continued to strongly represent Aborigines. Barry also presided over some of Australia's most well known trials, including that of the Eureka Stockade rebels and, unforgettably, Ned Kelly. He earned a reputation as a harsh judge, and his rulings often included stern lectures, peppered with poetry or Latin quotes. Persons of both sexes and all nations above fourteen years of age are admitted free without letter of recommendation, guarantee, payment, signature of name or address, or ticket of admission. Kirspop, W 2004, 'Redmond Barry and libraries', La Trobe Journal, No. 73 Autumn. Legend has it that according to Barry, State Library patrons needed to be over 14 years of age and have clean hands, but didn't need to wear a dress jacket. This meant that anyone, rich or poor, could use the Library. Barry continued his various works right up until his death in 1880, 12 days after the execution of Ned Kelly. He was given an impressive funeral attended by hundreds of well-wishers, and is remembered as a man devoted to his career as a judge, to the development of Melbourne's institutions, and to the welfare of others. Before Melbourne was even established, John Pascoe Fawkner was dreaming of how he wanted it to be. In the 1930s, an educational pamphlet taught children a version of their town's history.